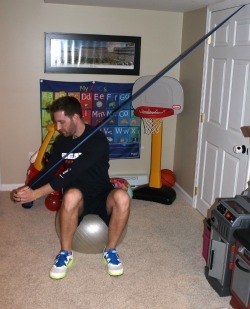 There are literally hundreds of exercises that you can perform with an exercise ball. 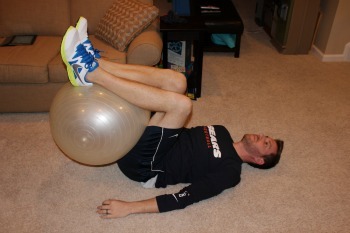 This stability ball workout, however, is designed for more advanced participants and will provide an added challenge compared to more traditional ball exercises. The exercises listed here incorporate multiple muscle groups to significantly increase the difficulty level. 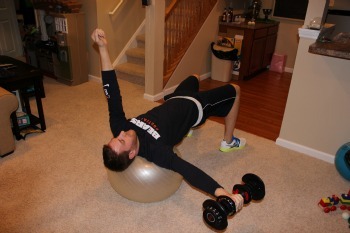 If you are just starting out performing core strengthening exercises with a ball, I would strongly suggest attempting some of the other exercises I have listed on the Core, Arms, and Legs pages listed at the bottom of this page. -Start by sitting on top of the ball. Slowly walk your feet forward, and lie on top of the ball with it positioned between your shoulder blades. -Perform a bridge by elevating your rear end and pelvis and hold this position. -Slowly extend one leg, and then return. Extend the other leg and then return. Continue to alternate leg kicks for a minimum of 10 repetitions. -Lie on your back, with the ball positioned at your feet. -Lift your legs and rest your calves on top of the ball, with your hips and knees at 90 degree angles. -Gently bend your knees, compressing the ball between your calves and the back of your thigh so that the ball doesn't move. 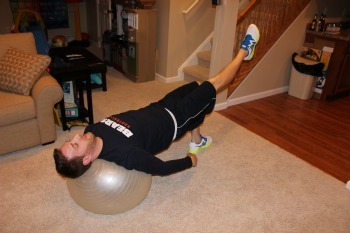 -While holding onto the ball with your legs, bring your knees to your chest to complete the crunch. Return to the starting position and repeat. -Start by sitting on top of the ball holding a light medicine ball or weight with both hands at your chest. Slowly walk your feet forward, and lie on top of the ball with it positioned between your shoulder blades. -Lift the weight to the ceiling and release your left hand so that you are only holding onto the weight with your right hand. -Slowly move your arms directly to the sides (keeping your elbows straight) while maintaining the bridge. Your arms essentially are making a "T" with your body. 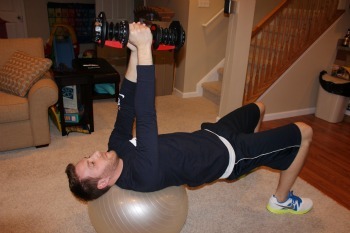 -Bring your arms back to directly in front of you and pass the weight to your left hand. Move arms back to the sides. Continue to pass the ball back and forth. 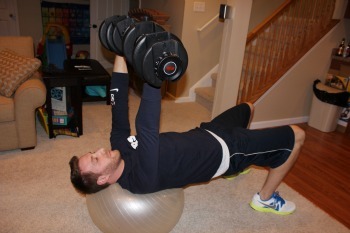 -This exercise is essentially the same as a traditional dumbbell fly on a bench except that you are now lying on top of a ball for added instability. -Lie on your back on top of the ball, with the ball around your shoulder blade level or slightly below the blades. -Hold free weights, start with your arms out to the sides and slowly push them straight up to the ceiling, fully extending your elbows at the top. -Lie face down on top of the exercise ball, with feet positioned wide, and the ball located around the bottom of your rib cage. Clasp both hands behind your neck with elbows out to the side. -Slowly raise your torso by extending your back and as you reach the maximum height, rotate your trunk to the right. -Return to the starting position and repeat, this time rotating to the left. 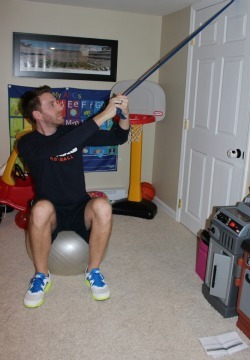 -To perform this exercise you either need a cable column machine or exercise band fixated overhead. -Sit on top of the ball with good posture and have your body facing at a right angle compared to the resistance. Keep the knee closest to the resistance bent, but fully straighten the knee furthest from the resistance. -Reach up and across your body to grab the band/handle and pull down and back across your body diagonally, making sure to rotate at your waist. -Perform reps to each side!